I always have considered Chinese food as my comfort food. I grew up eating it thus I know what to expect and I'm familiar with the flavor, taste and texture. I don't really get excited anymore when eating Chinese food, to me it is just a matter of it being cooked well or not. But still I was looking forward to HK's comfort food because it has been said that where ever you dine in HK, you can always expect to partake in good food. When we arrive HK in the morning, we were looking for a restaurant that was already open. We ran into Taiwan Kitchen, the place was packed so we decided to give it a try. The menu didn't have english printed on it so we ended up pointing and looking at what others were ordering. We waited anxiously, when our order arrived we were surprised to find slices of ham and luncheon meat with a fried sunny side egg on top of a bowl of steaming noodles. Every order also came with half a slice of thick-cut buttered bread. It kind of look weird but it tasted ok. The noodles were firm and the processed meat as toppings complimented the seafood broth well. We also ended up with a typical Western Breakfast, Sausage and Eggs. The three dishes came with hot flavored tea. The flavored tea was too sweet. I notice this plaque on the wall. I've no idea who Chua Lam is and in my opinion I think HK has a lot more to offer than this. Cafe de Coral is not your ordinary fast food chain. The food they serve absolutely taste fantastic, it's comparable or even better than the expensive chinese restos found back here in Manila. Located all over HK and food prices range from HK$ 26 to HK$ 45, it is a must try. Ordering is a breeze, you have to choose from the menu board (the menu has english written...) and pay the cashier. A number will be given to you, when the number is called you have to claim the food from the counter. One of the bestsellers is the Roast Duck with Rice. Tender pieces of Duck Breast glazed with a sweet, salty and tangy sauce. So Good!!! Cant have enough of this. Cafe de Coral's Milk Tea is a must try! The balance of the tea's bitterness and the milk's sweetness hits the spot. The Baked Thick-Cut Pork Chop with rice serving was huge, even if the dish was doused with tomato sauce on top, the breading was still crunchy. The Beef Curry was flavorful and hearty, just like how Chinese curries should be. We always pass by this Food Stall before heading back to the Hotel. We decided to give the spread a try. With no English signs and with the vendor not understanding English, we just pointed to what looked interesting. Prices range from HK$ 4 to HK$ 12. I'm not sure what kind of innards we ate but it wasn't as tasty compared to what I'm use to having back in Manila. 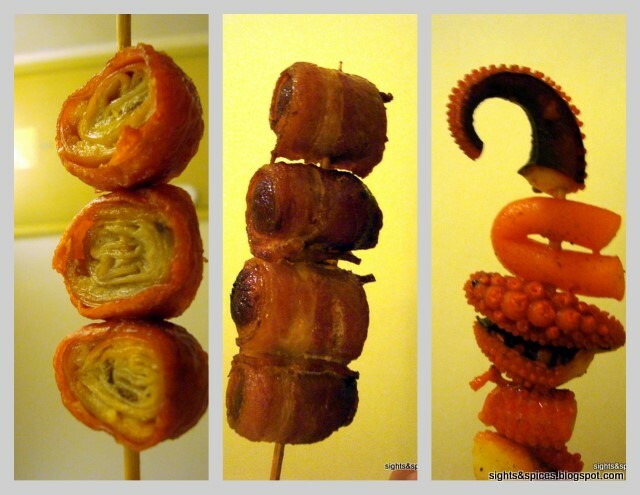 The bacon-wrapped squid or fish ball tasted ok. The grilled octopus was my favorite among the three skewers. The 1st thing I always noticed when i pass by the food stall is the aroma of the curried squid ball. The squid balls are stewed in curry oil the whole day turning the these colorless balls into a flavorful golden yellow delights. The balls were delicious, I wanted to try making these when we go back home. The steaming mushroom soup was perfect for the cold weather when we were there. Warm, hearty and filling. The cut up waffles was soggy and tasted bland. We washed all the food down with a bottle of Guinness Beer and a can of Tsing Tao. The next day we met up with our cousin, (www.shootfirsteatlater.com) we ate at the best restaurant in Asia, L'Atelier de Robuchon. (click the link to view the blog). After lunch, she gave us a tour around Mong Kok Area. She pointed out different interesting food places in the area. Bao Dim Sim Seng is a bake shop that sells Chinese Buns. Buns of different sizes, shapes and fillings. We tried the Chinese Sausage Bun, the bun was soft and moist. The Dessert Buns caught my eye. The porcupine, fish and chick shaped dessert buns were so cute and colorful. We passed by a Chinese Deli shop that sells different kinds of bread, biscuit and cookie. It reminded me of the deli shops in Macau. When I saw the freshly baked egg tarts I got excited and quickly bought three pieces. The egg tarts turned out to be a big disappointment, the pastry was too dry and the egg flan in the middle tasted bland. This shop sells whole dried ducks for people to take home and cook with it. Hui Lao Shan is a place that sells different desserts, their most famous of which is the mango shake. Though it tasted ok, I still prefer the mango shakes back in Manila. After an afternoon of food dining, tasting and shopping, we headed to Hang Heung for a dinner with relatives and VIP guests. The place serves typical Family Chinese lauriat dishes, the dishes are the perfect example of Chinese food being cooked well. While walking home from a whole day of eating, we pass by a snack shop and got a whiff of steaming dim sum. I have no idea what's the name of the store but the place was packed. The dim sums were being cooked in bamboo steamers outside the store. A very clever ploy to invite people in. I don't know how to speak Cantonese so I had no clue on what and how to order. I went up to the Lady and mouthed.."Siomai (Pork Dumpling) and Hakaw (Shrimp Dumpling)..." She smiled and told me something I didn't understand but I got what I want. The dim sum treats were absolutely delicious. Even with no soy sauce as dipping sauce, the dim sum were so flavorful and tasty. The Spinach and Meat Dumpling Noodles Soup tasted ok. The dumpling was delicious, noodles were firm but the only problem about the dish is the bland tasting broth. The Braised Beef with noodles was delicious. The beef was flavorful and has that 'melt in your mouth' texture. The Stir Fried Pork Noodles was delectable and savory. From street food to eating at the best restaurant in Asia, I'm glad to experience it all in a country that serves the best comfort food...Hong Kong. Yes, I've tried dumplings, roast duck and birds nest soup. One thing I plan and want to try in Beijing is the Chongqing Hot Pot. Also the crispy scorpion found in the street stalls.....have a good one!